Well, it’s already only 3 weeks until Christmas! How did that happen??! I have really been getting into the spirit of the holidays lately. 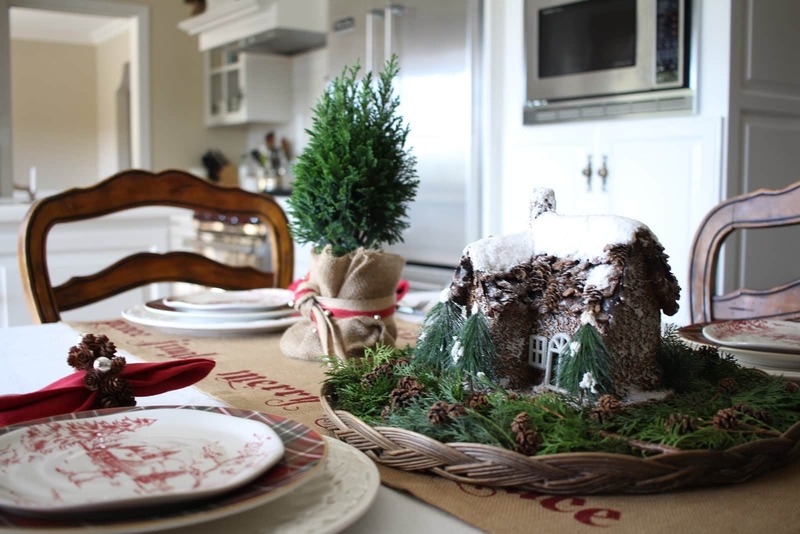 I don’t know if it’s because I had to decorate a little earlier this year for my two Holiday Home Tours here and here, or that it has been so cold here in California (a rarity this early), but either way, I am so excited for Christmas this year! 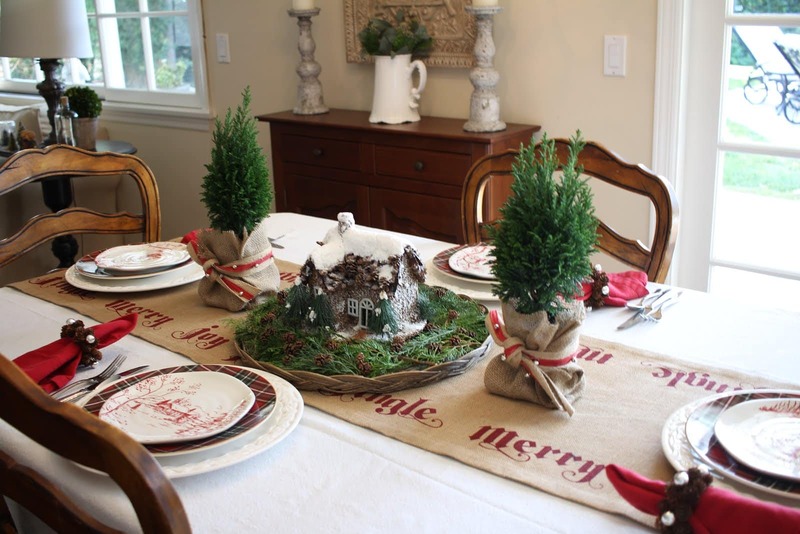 Part of what I love, besides the decorating of course, is hosting holiday dinners and parties. 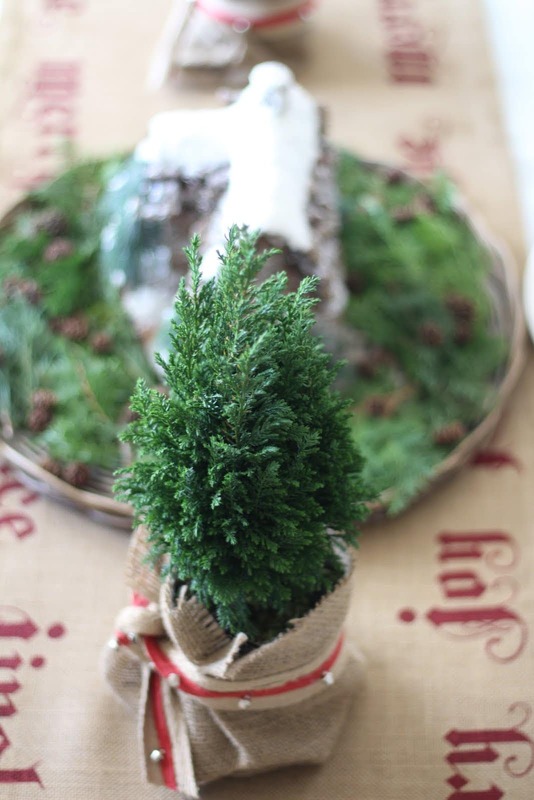 I’ve shared that I love tablescaping, and this time of year it’s especially fun. I know some people hate entertaining, but I truly love it. 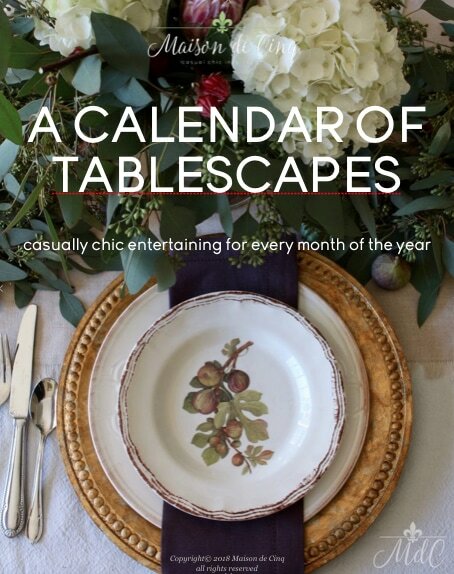 So with that in mind, I decided to compile an e-book featuring twelve of my favorite tablescapes! 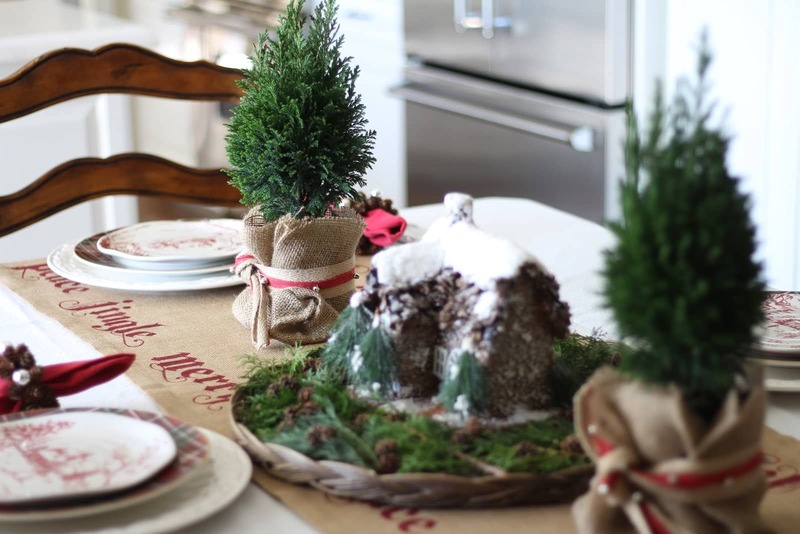 Today I thought I would share a casual nature-inspired Christmas tablescape. Hopefully, if you struggle with this kind of thing, it will help or even inspire you. 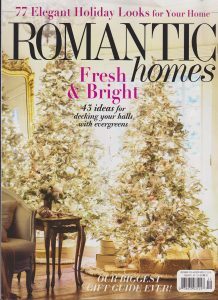 This would be perfect for a casual gathering, tree-trimming party, or even Christmas Eve dinner. 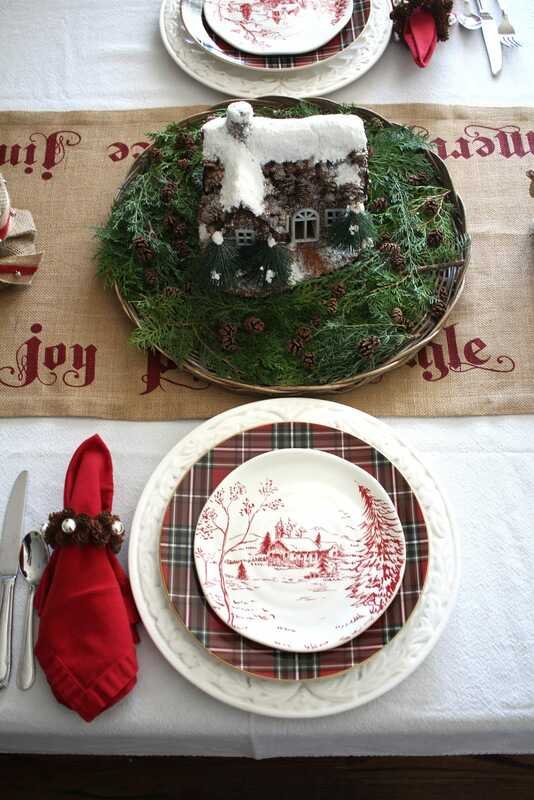 Usually my tablescapes are inspired by a particular theme, and this one was no exception. 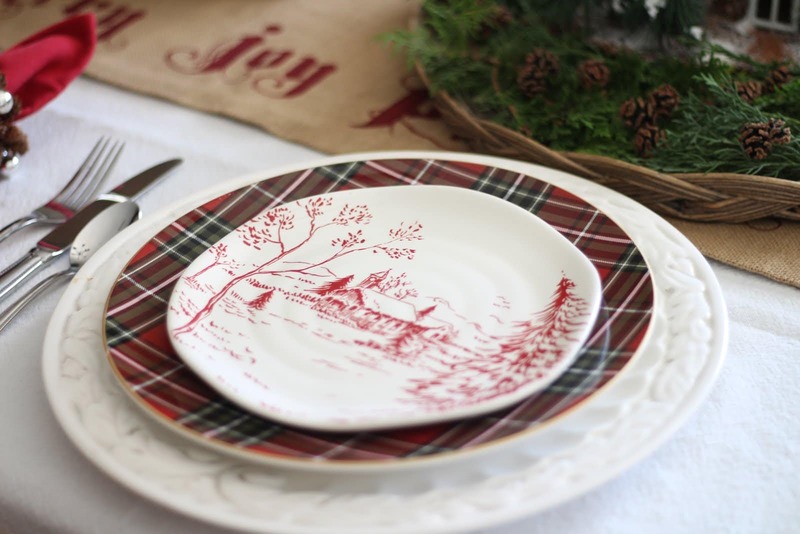 I found these plates at Marshall’s recently and since I passed on some plaid plates at Home Goods several years ago and have regretted it ever since, I knew I had to have them! 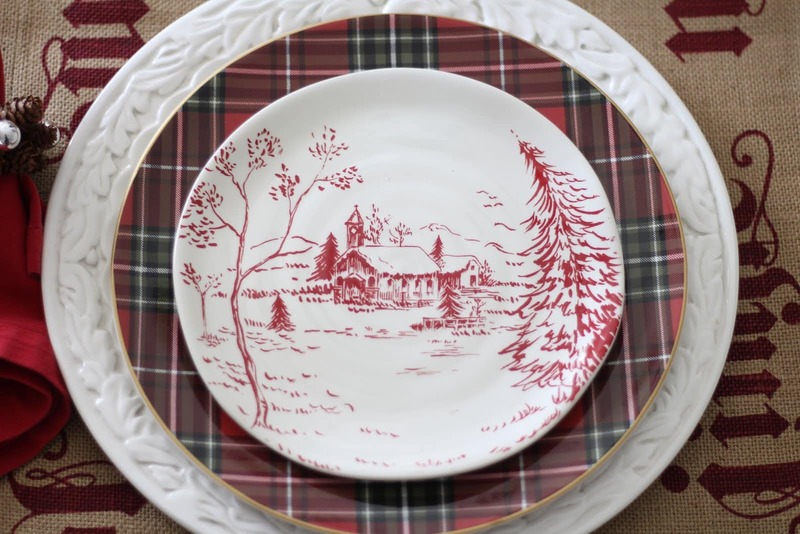 The cute red toile plates were from last year, and I knew they would look amazing with the plaid ones. 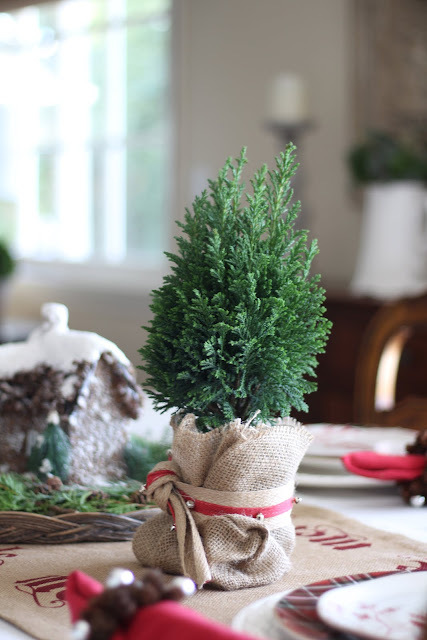 I also wanted to incorporate a lot of natural elements so I used some little live pine trees (similar here, here, and here), tiny pinecones, fresh greens, and burlap. 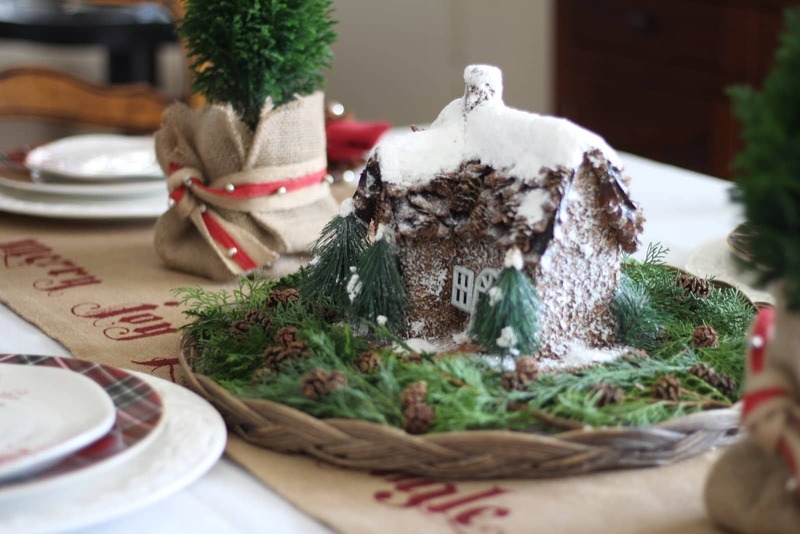 I also found an adorable little “cabin” at Home Goods and made that the centerpiece. Placed atop a French vintage basket with some greens and tiny pinecones it creates the perfect casual rustic centerpiece. I also had an old runner from Pottery Barn that I love, but had never used! 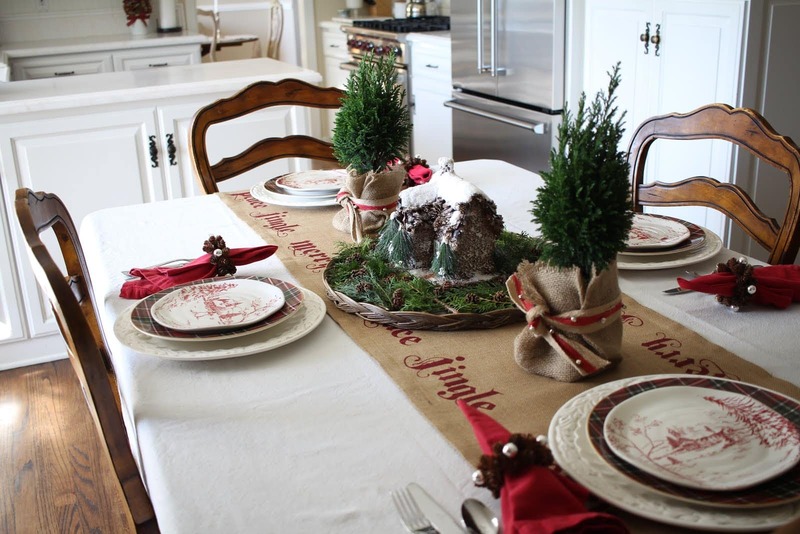 It seemed to fit so that combined with pine cone napkin rings, and red napkins, completed the look. This runner is discontinued but can still be found on Ebay. It has large jingle bells hanging at the four corners, and also has matching napkins. I just adore it’s natural charm! 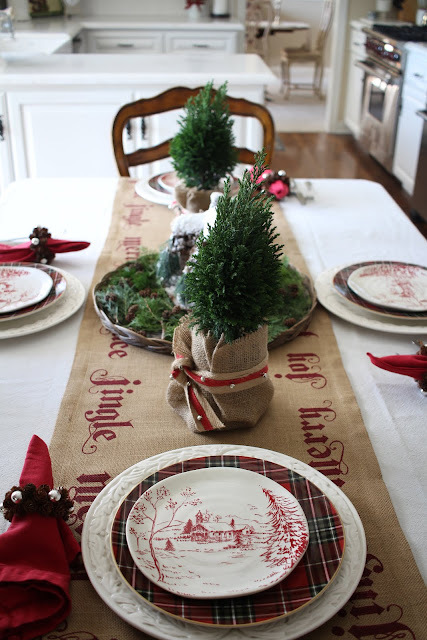 Burlap bags served as containers for the pine trees and I tied them with some jingle bell ribbon I had on hand. 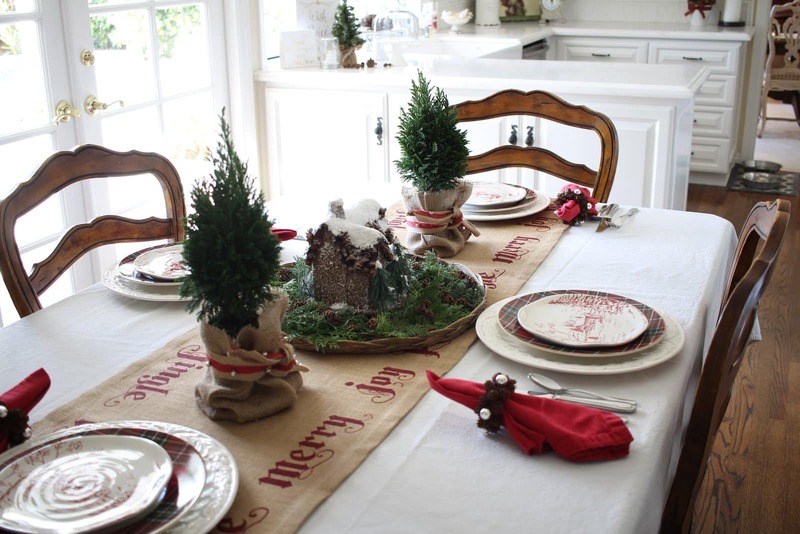 For lots more holiday tablesetting ideas (as well as the rest of the year!) 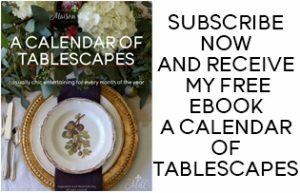 be sure to sign up for my emails and get your free e-book, A Calendar of Tablescapes! Yay! Thanks Alicia! And you do beautiful tables – I'm sure yours will be gorgeous! 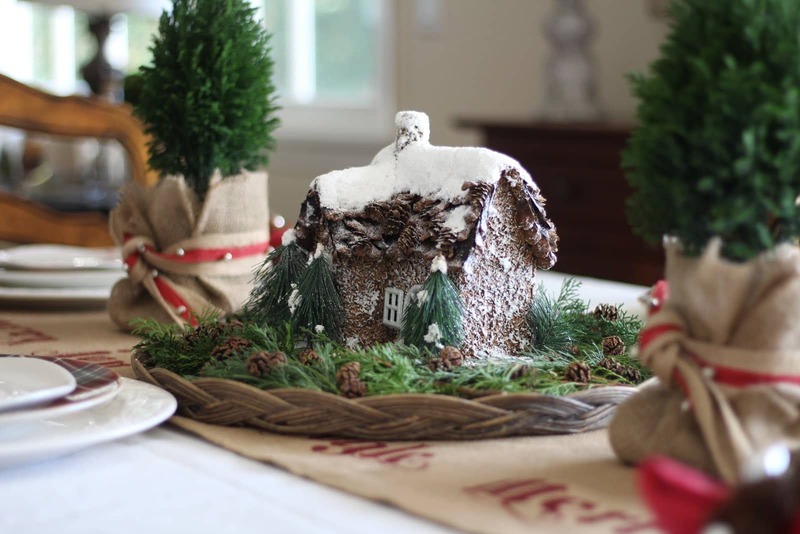 It's beautiful Sheila… I love how you set the two trees on the sides… your giving me ideas to do mine. Beautiful job! Thanks Shelley, I was so excited to find them!! Hope you are enjoying the season too! Love this table and those pretty plates! So glad you are enjoying the holiday season so far!